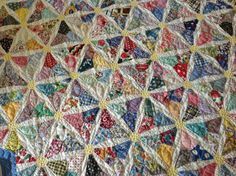 Homespun Stitchworks..... For the love of vintage: Scrap quilting with some hand embroidery too.... with memories of my late Dad. Scrap quilting with some hand embroidery too.... with memories of my late Dad. My father. He was the rock, the guy you went to with every problem. I am slowing working on a quilt for myself with vintage fabrics and linens. Included in this though will be some fabric cut from things that I have sentimentally kept over the years. I think it will be lovely to put some things in this quilt that mean an awful lot to me. Now comes the dilemma for me. One thing I have kept is a shirt that was my Dads, he died in 1999. I wish I had taken more but in the state of mind I was in, there was not a rational thought in my head. My Aunt was helping my mum and thought it was wise to bag all of my Dads things up before the funeral and get it sorted so my mum did not have to do this after. I did not make a noise about it because I was grieving myself but I had the fore thought to grab a shirt. I think it was just me not letting all my Dad go but I wish I had grabbed more! So I have this shirt which is hung in my wardrobe and never been washed and when I have been sad or missed him terribly in the first few years I would slip it on and bring my knees up inside it like he was hugging me...... It is now time to do something with this said shirt I think. Cut it up and stitch it into my quilt project, do you think I can put scissors to it!!! I know it is the right thing to do. This will be my quilt and not for sale and not a huge one so I can easily wrap it around me..... I think use all the shirt in patches and also hand stitch his name and birth date on one of the patches. This way it is used and not just shut in a wardrobe doing nothing. My father would agree if he could tell me so my first step is to wash and iron it. Yes it may not seem a lot to those of you reading this but it is to me... His shirt is white and blue striped and is only short sleeved. I thought I could use some of the buttons too on it. Is this shirt vintage well yes because even my Dad bought it in a charity shop ( got to love him) so I think it is at least 22 years old because I remember him wearing it an awful lot years before he died. So I would put it in the 1980's somewhere. It will mingle with 1900 vintage linens and 19230/40 vintage hand embroidered table cloth pieces as well as beautiful 1930 eiderdown paisley's as well so it will be in good company! So this morning I am going to hand wash said shirt and air dry it ready for my huge step of scissors. I am collecting fabrics for this quilt of mine and doing different squares for it. I am not sure how it going to turn out but it will be filled with wonderful personal memories so it will be a treasure to me. There will be lots of hand stitching in it, I have decided so it is a labour of love and will probably take at least a year I would think. There are these book out as well and I would like to put them on my wish list for Birthday and Christmas. I was originally going to do all log cabin squares but I am not sure now .... I think I may stitch different ones .. best make up my mind don't you know! wardrobe and letting it not be seen. I am taking several small stitching projects with me to complete in our down time away. Instead of taking a book I am going to stitch I think..... I saw this quilt which I thought was stunning so it has me redesigning in my head. I am feeling better with the ear infection although not quiet 100% but I am getting there, I would like to say that is the reason of making me indecisive but people who know me, well would just laugh! !